July 15, 2010 by Katie V.
Once upon a time, I was a mother-to-be. My belly grew as did my excitement to meet my little one. I waited for him and I planned on being the best mother I could. I read books, watched films, and listened to all the advice given to me. I was once a mother-to-be. Once upon a time, I became a new mommy. 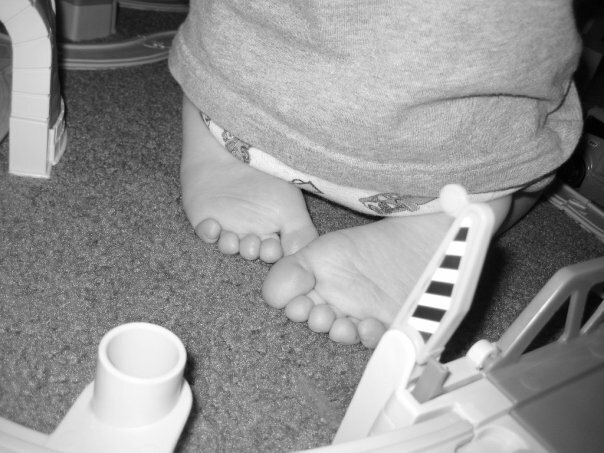 I had a little boy with little feet and big dreams. He was soft and sweet, small and new. It was tiring those first moments when everything was new and different. But I’ll cherish them. I was once a new mommy. Once upon a time, I turned into a “Mama”. With his sweet voice, his bright smile and his tender laughter that tickled my heart and sent chills down my spine, he soaked up the world with an unending need to learn. Through him, I saw the world anew. I was once a “Mama”. Now I’m a mom. I answer the never ending stream of questions about everything. I read the words he is quickly learning. I let him roam freely, taking his once small, delicate infant toes and exploring the world around him with his now large, big boy feet. As I watch him wander and search out new experiences on his own, I miss the cute little toes that curled around my fingers and tucked under my tummy in the middle of the night. I miss the small fists that grasped at my fingers, holding on to the only thing they knew. I miss being his mother-to-be, his new mommy, his mama. Now I’m a mom. A proud mom at that. This is such a sweet post. Well written, I really like the way you put this together & the repetition. Yeah, it’s the poet in me :o) Thanks for visiting.